Hop there if you do. And a hop, hop there. Hurry up! Hop it up! Hop as fast as you dare. Pour 1/4 cup of dishwashing liquid into a contaner (a low shallow dish works well). Add small amounts of water and tempera paint until the color is intense. Put a straw in the paint mixture and blow carefully until the bubbles start to overflow. Gently place the paper over the bubbles, then lift carefully. When dry, cut into desired shapes. Make three colors of jello. After jello is set, layer into a clear plastic cup. and some great early childhood websites such as Kids Chalkboard, Printable Games, and the Activity Cupboard. Take the time to browse and see what will work for you. My experience with resources like this is to take the time to download the must-have lessons now- you never know when a webmaster decides to shut down their site. This entry was posted in Uncategorized and tagged wednesday website on April 15, 2009 by ktoponce. If you are ever searching for cute churchy clipart, or Family Home Evening lessons, or ideas on incorporating religious teaching with your little ones, check out Sugar Doodle. I found them as a fabulous resource when compiling my daughter’s most recent quiet kit and found myself downloading several fabulous lessons such as this GREAT week long Easter idea (I wish I had found this sooner!!!) and a cute way to present the Easter story. Enjoy! This entry was posted in Uncategorized and tagged websites, wednesday website on April 8, 2009 by ktoponce. I am writing my Wednesday post with about 3 hours left until Thursday! My daughter is recovering from her very first stomach flu and so my mind has been very much preoccupied in her health! I can watch the dr.’s give shots but there is something about seeing my child cry in pain and throw up that makes my heart ACHE. Playing FreeRice will not only build your vocab, but you will be a wonderful role model of continual learning to your little one. We just don’t learn until college is over- it’s a never ending process! And as your vocabulary increases, the more word-rich your tot’s environment will be. You can also take time to talk about helping others in need.. although this concept might seem abstract at first (since it’s online), it is never too early to set a good example! This entry was posted in Uncategorized and tagged website, wednesday website on April 2, 2009 by ktoponce. Following in suit with my latest Montessori Posts, I wanted to delve into a website that gave great ideas on setting up that “prepared environment“! I decided to share some of the great posts that I have read from a newly discovered blog- Montessori Mum! She awarded me with my second award that I will post about later- so in return I will share with you what I have learned through reading how she implements Montessori with her toddler! labeling clothing drawers with picture cards– a great step in giving little ones the ability to choose outfits! This post is small steps towards independence- and that is exactly what you are giving your child! She also suggests having your child do as much as she can in the dressing process- if its just pulling her head out of her shirt or putting her shoes in the correct place, it is still something! making your home more accessible to your little one– check out this post for some great ideas around the house to bring the big tall world of us adults down to fit their needs. She shows options throughout her house. I just love that her little one has her own dish cupboard… very cute! another post about the Montessori environment throughout her house– this time she delves into the kitchen and bathroom areas! Well I am just grateful that she is willing to post her pics because it is really giving me some great ideas! My favorite part of this post- the little kitchen table for prep work. I also like that she is going to hang hooks for her hats- it made me think that maybe we could hang some of those really sturdy plastic hooks with the sticky tape… I can’t think of what they are called… anyway , they are pretty strong and supposedly come off easy. We could hang some inside our coat closet on the door so she can hang up her jacket by herself! Just a random thought! last, but definitely not least, you need to check out the pics of her adorable little Montessori area for her daughter. It is so warm and inviting and next to lots of natural lighting… it’s beautiful! As you look around the room you will see the open shelving, child size table and chair, and a bright little nature area. 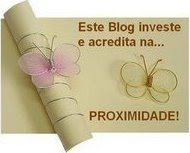 This award is given to a blog that invests and believes in PROXIMITY – nearness in space, time and relationships! These blogs are exceedingly charming. These kind of bloggers aim to find and be friends. They are not interested in prizes or self-aggrandizement. Our hope is that when the ribbons of these prizes are cut, even more friendships are propagated. Please give more attention to these writers! This entry was posted in montessori and tagged wednesday website on March 25, 2009 by ktoponce. I thought I would mix things up today and post 20 great teaching tools that are found at Oriental Trading. I first learned about this company as a teacher and continue to receive their catalogs. There are TONS of great crafts for kids that you can buy in bulk, as well as party supplies, art tools, gym equipment- even party gear! I studied my latest catalog to come up with 20 teaching tools under $20 from Oriental Trading. Ribbon sticks– great for creative dancing and movement! Super Sturdy Parachute– great for teaching teamwork and cooperation! You can imagine the fun the little ones will have running underneath it!! Beginner’s Scissors– set of 12 scissors that boasts of being able to only cut paper- not hair! Sticker Scenes and Giant Sticker Scenes– scenes with repositionable stickers. These take me back to the colorform days! The smaller ones would be great to stick into a quiet kit. Look It’s Me! Magnets or Keychains– you can design one for every member of your family and hang on the fridge or attach to your keys! I lb. of Great Big Buttons– these extra large buttons come in 8 colors and shapes. 72 Totally Terrific Tipped Yarn Laces– these would be great for stringing beads or for lacing cards. 6 Plastic Cool Craft Trays– I have seen these as Tot trays on Totally Tots and they are perfect for keeping activities neat and organized! Fabulous Foam Wall of Stars– there are 24 bright star shaped frames that could be used to portray family, friends, or your tot from 1 month to 24 months! Of course this would be perfect for a classroom, too! 260 Fabulous Foam Self-Adhesive Jumbo Letters– These big letters are perfect for little hands! 6 Super Durable Dressing Boards– teach your tot to snap, tie, button, buckle, zip, and lace with these durable dressing boards! Stack it High! 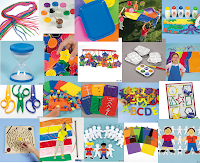 Pegs and Peg Boards– foam boards and plastic pegs great for stacking! Wooden Magnetic Labyrinth– There is one of these at our local children’s museum that my daughter likes to play with! This is good for hand eye coordination activity! Dilly Dot Markers– these dot markers are designed for small hands and come in either neon or bright colors. 6 Rainbow Clipboards– Can be used for different subjects, family members have a specific color for family night activities, or when going on color hunts. I am a big organizational tool fanatic and so this is something I would love! There you have it! 20 teaching tools under $20 from Oriental Trading. There is SO much more- especially if you teach school (a lot of the supplies come in bulk). This entry was posted in Uncategorized and tagged teaching tools, wednesday website on March 18, 2009 by ktoponce. I am going to be featuring a website every Wednesday from other “home teachers” of young children that I find extremely beneficial. This week I dove into Allie’s website titled No Time For Flashcards. I spent a good hour reading about the educational crafts that she does with her son. There are crafts about the letters, colors, transportation, 5 senses and so much more!! These projects aren’t just coloring sheets either- each craft has different tools (some will already be in your home!) that are pictured so you can see EXACTLY what your child needs to complete the project. I love that she ties in good literature and music that tie everything together. Allie, you are AMAZING!! I was going to make a top 10 list of my favorite posts, but I ended up with 20 and I could have done more! These are ideas that I love so much that I plan to do them with my own daughter!! bouquet of hearts (this is the one craft that I have done with Jacs and it was a big success!) Make cardstock hearts, color, and add green pipe cleaner or popsickle stick as a stem! sensory fun with rice– A great activity for those little ones that love to scoop and an portable alternative to a sand box! Just pour rice into an old cake pan, add a small amount of glitter for sandbox “bling”, and the tools for scooping. For those young tots this would be a great activity outside! homemade balance beam-What a fun yet easy way to work on balance! Bring in a sanded down 2×4 and voila! Instant balance beam minus the long fall. texture collage– A fun way to talk about the sense of touch and different texture words. Collect items with various textures- feathers, different types of paper, sand paper, foil, etc. Then create away! one of my favorite ideas- a color hunt. Go exploring through the house with a paper bag collecting items from a pre-selected color! Great activity for those eager little minds and busy little hands! It is recommended that children under 2 have items preplaced low to the ground for your toddler’s accessibility. Depending on the age- assign multiple colors. color collage– Collect different items of a specific color. I would use a variety of mediums, too! It is suggested to add in shapes of that color as well. winter craft- snowman blocks. Very cute blocks using empty spice containers making a snowman! Especially designed for those tower builders out there! family photo quilt– great for thanksgiving time! Use photographs of family members, cardstock, and ribbon to create a wall hanging to show off our fabulous family! great Christmas craft- candy christmas trees. One upside down sugar cone, green frosting, and yummy candy can make quite the decorative tree! make “cloth” placemats for special occasions using paper towels, markers, and contact paper. What a wonderful way to get your toddler involved in decorating for the holidays! make your own crayons using broken crayon pieces and a muffin tin. I think this is a fabulous science lesson as well for the older kids! color squishers– this looks fun enough for me to do! The materials are easy for this activity- at least 2 colors of paint ( I wouldn’t do too many colors or you will end up an ugly brownish black) and a ziplock bag! toilet paper roll necklace– using an old toilet paper roll, color, cut up roll in smaller pieces, and string onto yarn. Good for lacing practice! bath proof painting– what I love from this post is the creativity in using different “tools” to paint! I never would of though to use a net bath sponge as an artist’s brush! all you teachers and alphabet fanatics out there will love this Chica Chica Boom Boom Coconut Tree craft. This is inspired from the book and is a great project to kick off learning those letters! OK, so I can’t fit the rest of my ideas on this list, so I am adding a whole category of ideas labeled 5 senses. Definately check out the sound search and the I spy activities. These are both projects that the most active of children can appreciate! The teacher in me LOVES that the toddler is making his own observations! This entry was posted in learningtime and tagged wednesday website on March 11, 2009 by ktoponce.